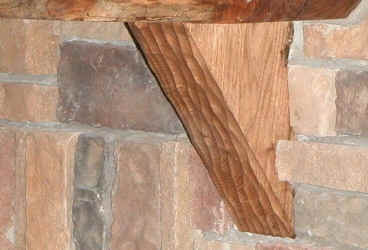 Two styles of wooden mounting brackets are available for Log Style Mantels. Brackets are not always necessary to install a mantel, so check with your dealer to see what they recommend. For mantels up to seven feet long two brackets are usually used, but more might be required depending on the weight of the mantel you choose. If you need a bracket, or if you just prefer the look of a wood bracket, here is what we have available. TRIANGLE BRACKET- These brackets have an 8" long side and a 10" long side. They can be installed either way depending on the width of your mantel. They are made from the same material as the mantels and so are about 4 inches wide. Triangle Brackets can be installed before the face material is put up on the fireplace, or if the surface of the stone or brick is relatively flat, they may be installed after the face is up. 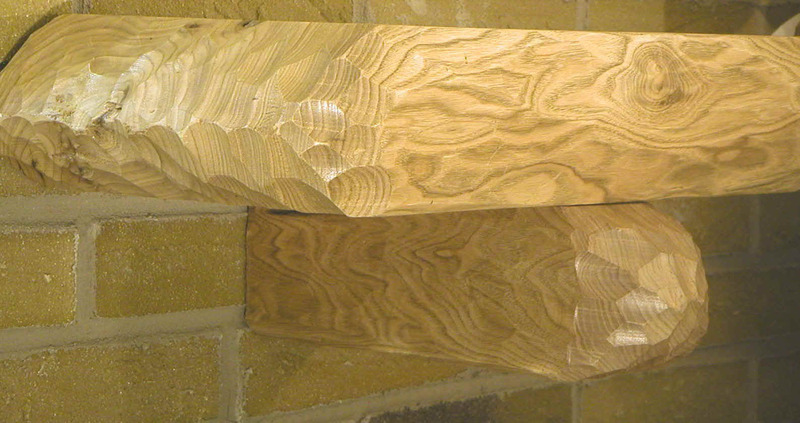 These brackets are available in the full variety of Log Style Mantel species and styles. SQUARE BRACKET- These brackets are about 4 inches square, and 24 inches long. They are available in the carved, draw knife or square style. They are available in the same species as the mantels. These brackets normally should be installed while the fireplace is under construction since they will be fastened to the sides of the wall studs, or imbedded in masonry. The bracket is carved on three sides and the end. The fourth side is flat so the mantel will rest flat on it, and may be fastened with construction adhesive or long screws.